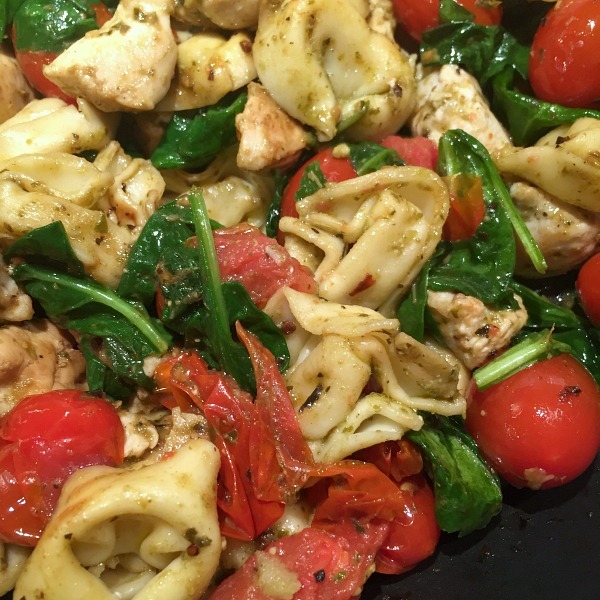 It’s been one of those crazy weeks, you guys, so let’s just do a super easy 30 minute dinner recipe today using refrigerated tortellini and prepared pesto. 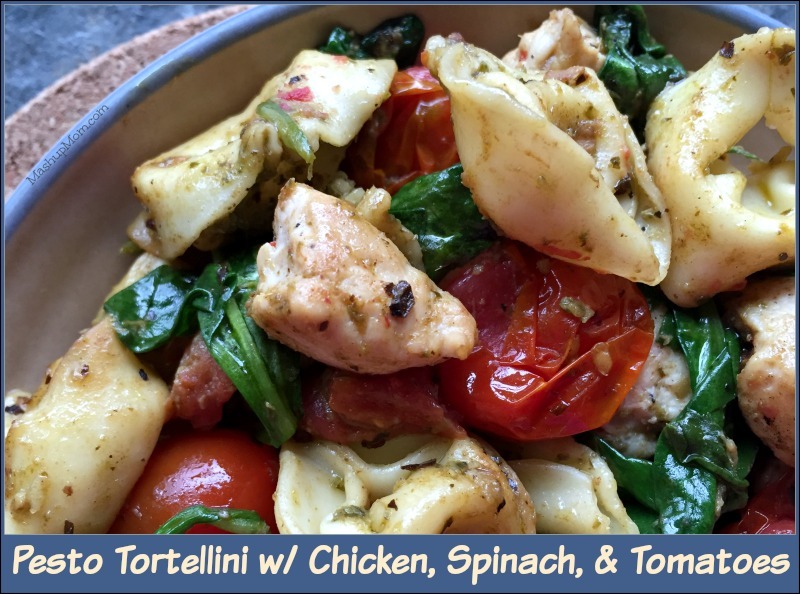 Without further ado, in this week’s Sunday Scratchups recipe from scratch around grocery sales and affordable ingredients we have… A simple Pesto Tortellini with Chicken, Spinach, and Tomatoes. I actually prefer making pesto from scratch, but since the fresh basil is long gone from my cold Chicago November garden and I was not good about freezing any this year, jarred is an acceptable alternative. So, I usually just pick up one of the little jars at ALDI — but was right over by Trader Joe’s yesterday so decided to try theirs instead. Survey says: A bit more expensive, but fairly comparable in flavor! Cook tortellini according to package directions, drain, and return it to the pot. Meanwhile, heat olive oil in a large skillet over medium-high heat until shimmering and swirl to coat the bottom of the pan. Chop the chicken into bite-sized pieces, season with sea salt & pepper, and brown 3-4 minutes per side over medium-high heat or until cooked through. 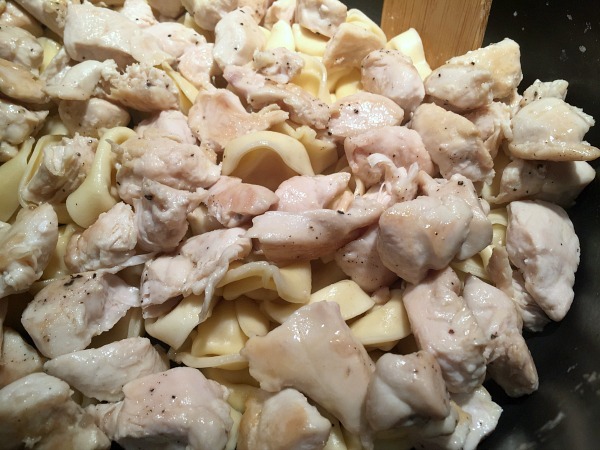 Remove chicken from the skillet and dump it into the pot with the tortellini. Reduce heat to medium under the same skillet you used for the chicken, add a little more olive oil, and saute the garlic very briefly. Add the grape tomatoes and season them with crushed red pepper and basil, then continue to saute tomatoes over medium heat for about eight minutes, stirring occasionally and scraping the browned bits off the bottom, until tomatoes are just beginning to wrinkle and burst. 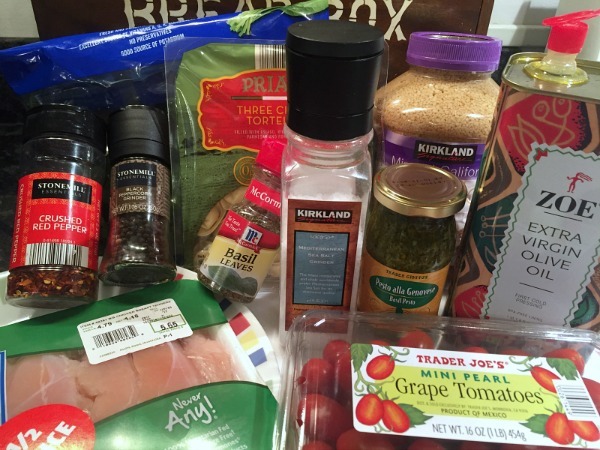 Add the cooked tortellini and chicken into the skillet with the tomatoes. Reduce heat to medium-low and stir in pesto to coat, then gently stir in spinach. Continue stir gently and occasionally over medium-low heat until spinach is nicely wilted into the pasta, then serve. 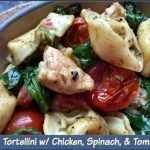 This pesto tortellini recipe is super flavorful, especially considering how few ingredients you’re actually using here. We enjoyed ours with a baguette and garden salad and, boom: Dinner is served! Both boys were fans, and this entire skillet-full of pesto tortellini disappeared in no time flat. 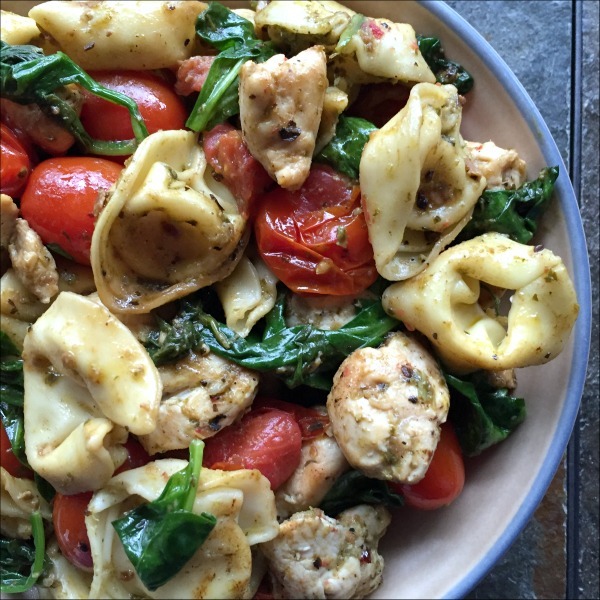 Yeah, you’re taking a little dinner shortcut by using the prepared tortellini and pesto — but you’re also getting your protein and fresh veggies in at the same time, so: Pesto tortellini with chicken, spinach, and tomatoes for the win. That’s what real food meets real life is all about. Yum! This pesto tortellini recipe is super flavorful, especially considering how few ingredients you're actually using here. 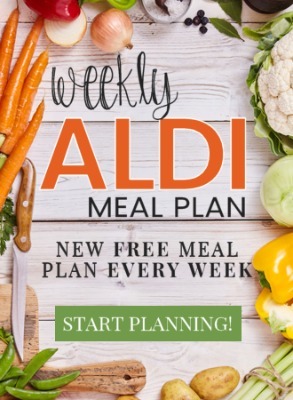 I actually found half price chicken tenders on clearance this week, but it's fine to use regular boneless skinless chicken breast since you're chopping it into pieces anyway.